Our pitch to investors has been that by investing in a mix of quality and value stocks that you can avoid the worst of the market volatility. Our portfolios didn’t chase the market higher in January, and then made up ground in February with our direct international portfolio posting a 1.6% gain and our tactical portfolios all returning between 0.4% and 1.3% – all while global share markets fell. The foremost question is what to do from here. In particular, February performance was driven by Scandinavian investments. Finnish paper stock UPM-Kymmene was up 10%, Norwegian aquaculture stock Marine Harvest up 16%, Swedish Match (tobacco) rose 9% and Danish wind turbine manufacturer Vestas Wind increasing 10% were the strongest contributors. We are sitting on a considerable cash balance in all of our Tactical portfolios – our Tactical Growth fund targets a 10% exposure to cash and bonds, our weight is currently 34%. We have even more cash in the more conservative funds. So we have a lot sitting on the sidelines, waiting for the right moment. We also have low inflation, government stimulus in the US, plenty of central bank stimulus globally and, quite frankly, little in the way of alternative investments. The big fear is that wage growth might finally reverse its decline. 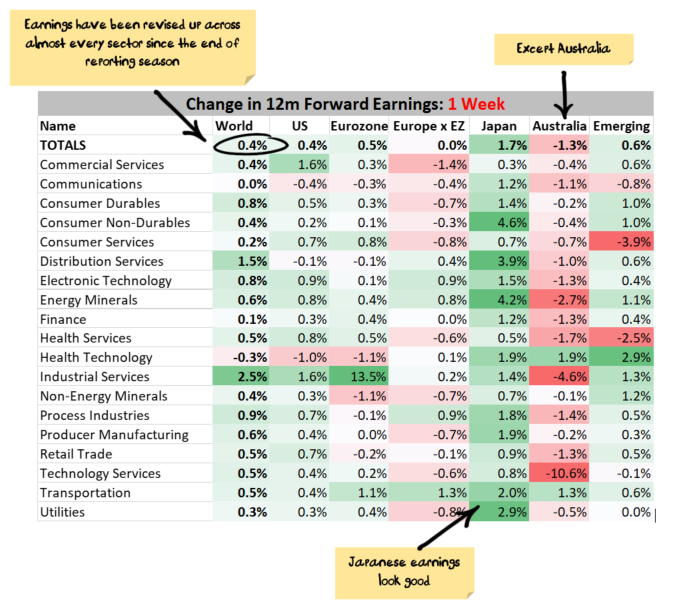 But, in its initial stages, wage growth is going to flow through to increased demand, offsetting any fall in margins. So, improving fundamentals are supportive of higher prices for stocks. There is the potential for a trade war. Which is a major negative. More on this later. Not as supportive of higher prices are valuations. There are lots of other ways to cut valuations, some look better than others but none suggest the market is cheap on a long term basis. 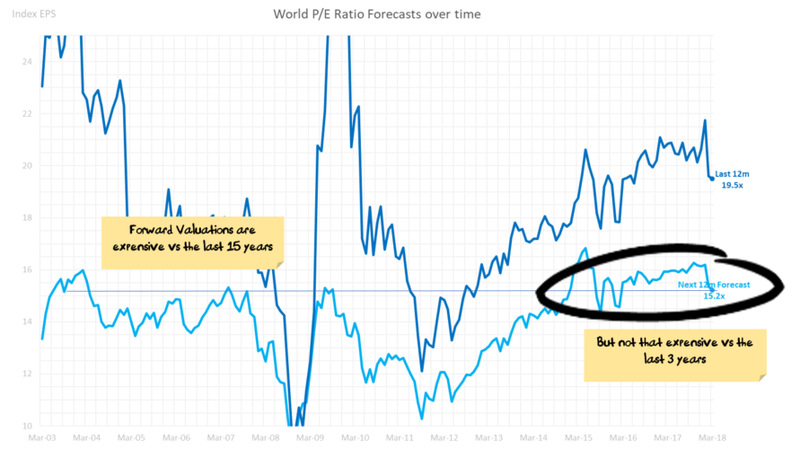 On a 2-3 year basis valuations do look better. 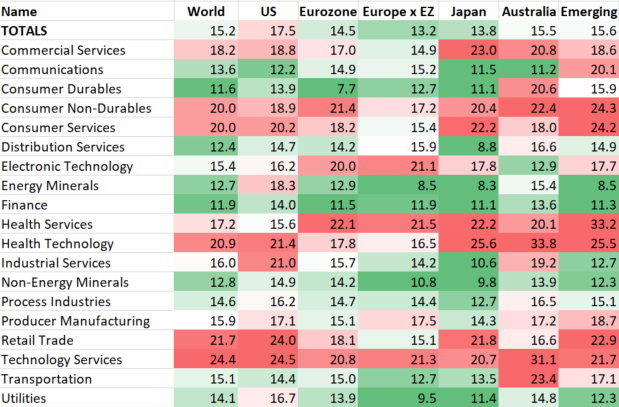 When you dig into different sectors and markets, while there are some segments that are cheaper than others, there are no standout regions that are universally cheap. So, fundamentals look good, valuations don’t. Which, despite all of the ups and downs of the last month is exactly where we have been for the past year. 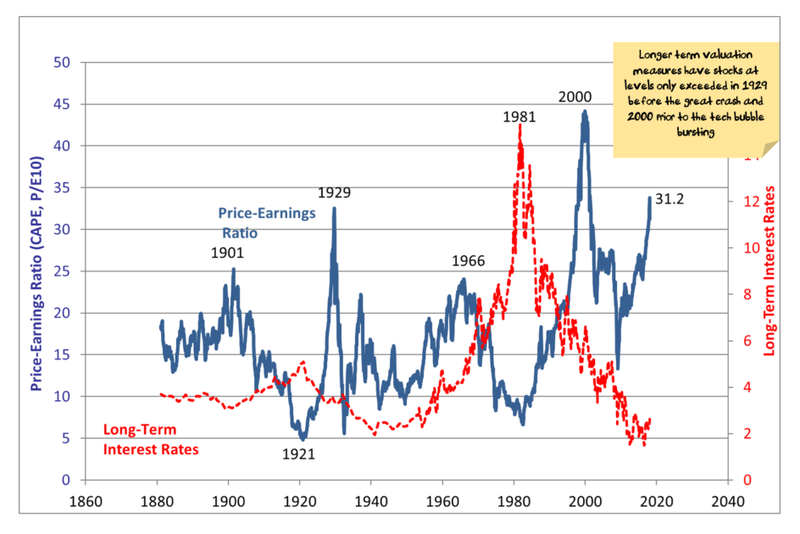 There are two ways to “cure” high valuations: higher profits or lower stock prices. Our tactical asset allocation continues to be based on getting as much exposure as we dare to over-valued equities that continue to get even more over-valued while maintaining protection in case it all unravels. To be clear, we don’t think that we have reached the end of the current investment cycle, especially so as the long-awaited Trump tax cuts are on the verge of triggering a late-cycle US boom. Can this be derailed by a trade war? Yes. This will be a key focus over the next month or so, working out how much of Trump’s trade war is hot air and how much is a genuine threat. Click here to register for our 8 March webinar on this topic. The returns above include fees and trading costs on a $500,000 portfolio. Note that individual client performance will vary based on the amount invested, ethical overlays and the date of purchase. The benchmark returns do not include fees. The crucial question (as usual) will come down to China. Chinese growth from 1990 to 2005 was driven by increasing trade, increasing urbanization, improving demographics and prioritization of capital expenditure over consumers. All of that is changing (see our primer for more details). Since the financial crisis, China has relied on the same drivers of growth, but rather than being a consequence of economic need it has been driven by increases in debt. 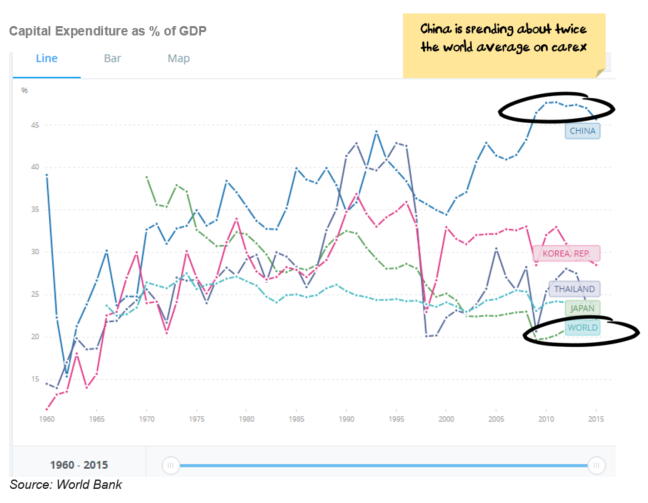 So, synchronized global growth is a huge opportunity for China to rebalance its economy. The question is will China use the strength in the US and Europe to rebalance its economy? If the answer is no, then we are probably headed for an epic boom/bust. 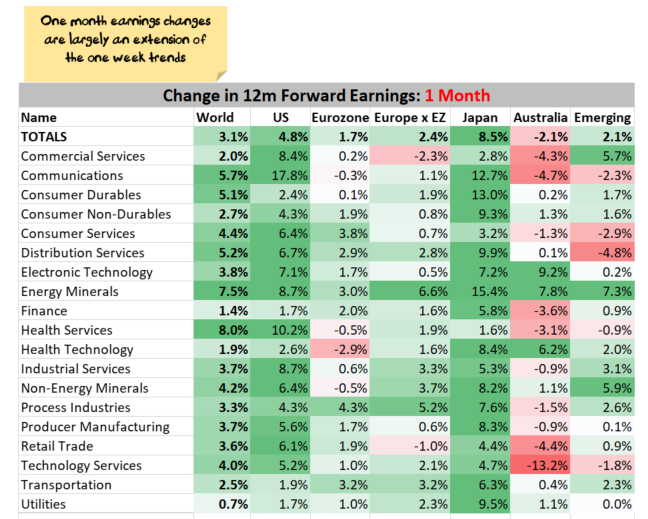 Europe emerging from the depths, US turbocharged from tax cuts, Japan showing signs of life, if China keeps it foot to the debt accelerator then it could all add up to boom-time economic performance. Until the debt runs out. And the sugar hit from US tax cuts wears off. And European/Japanese structural problems re-emerge. This is not our base case, but it is entirely possible. If this is the case then resources stocks are the place to be invested, the Australian dollar will stay high and the lucky country will stay lucky. 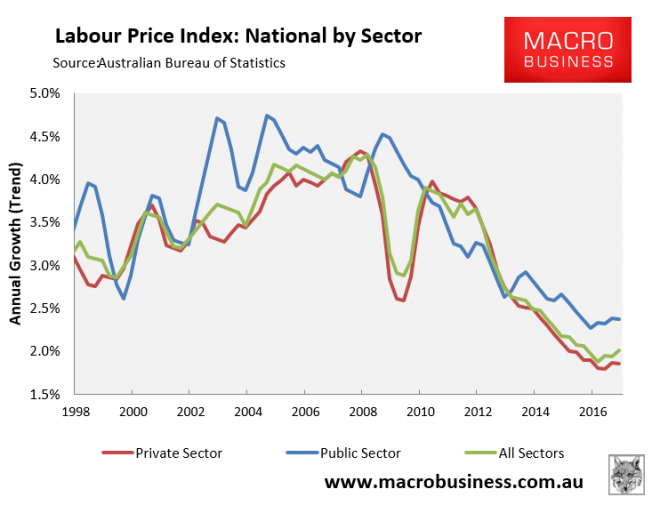 In summary the high will be higher for Australia, the crash will be more severe – but the crash will be a fair way off. 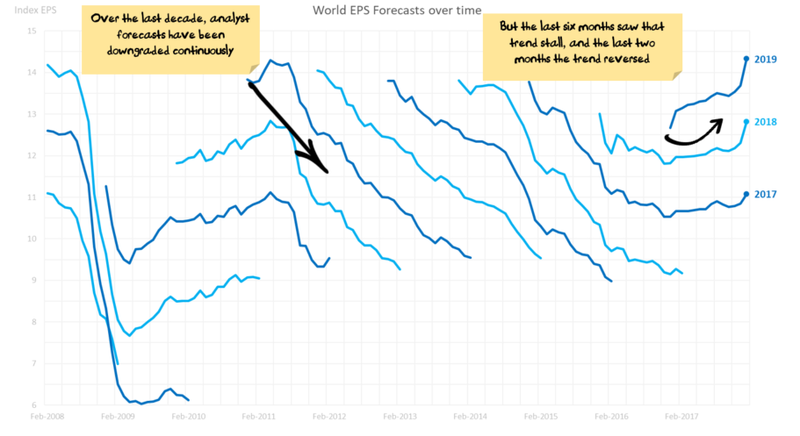 Our portfolios are probably going to increase in this scenario, but not as fast as the market. This makes the most sense for China – use the economic strength in Europe and the US to rebalance the Chinese economy. This is our base case. We expect that China will make a gradual transition to more consumption and less capital expenditure, and our portfolios are positioned for this outcome. The danger is that the Chinese economy slows too quickly – which would see share prices fall – basically a re-run of 2014/2015. While our current portfolios have some protection from this event, under this scenario we would be reducing our shareholdings further. I note that this is the most uncertain of the assumptions that are driving asset allocation at the moment. It is our key focus currently – particularly as winter shutdowns are distorting statistics. China: Rebalancing is occurring, the question is how fast Chinese authorities allow it to occur. Trump: Taxes are through as we expected. Our base case has been that trade wars will be more hot air than follow through, but events of recent days are putting that assumption under some pressure. Europe: Grinding recovery. We are not expecting great things, but note that the number of political risks has reduced in recent months. The major long-term issue is still the significant imbalances between Germany and most of the rest of the Eurozone. Our core position is that Trump is trying to engineer a boom. It will not be sustainable and will likely be followed by a bust that leaves the US economy in a worse position but that is a future problem – positioning the portfolio for the boom is the current issue. The proposed tax cuts are badly targeted by giving most of the benefit to the rich and to companies, trickle down is unlikely to work, the tax cuts are unsustainable, and they are only a short-term “sugar hit” for the US economy. But it is going to be such a huge stimulus that you don’t want to stand in the way of it as an investor. overweight stocks with US exposures – subject to valuation. The practical implementation of this has been buying non-US stocks that are exposed to the US. activity still seems to be slowing, although the last few months have been difficult to get an accurate read on economic activity due to winter pollution shutting down of a considerable amount of industrial manufacturing, in particular, steel production. We would expect that some of the strength in commodity prices in July/August reflected the bringing forward of production in front of the shut down. Then, the weakness in September represents the shutdown. Finally, there is likely to be a bounce in Q1 2018 due to “catch-up” production. So, the true trajectory is going to be difficult to ascertain accurately until we are through this period. we are probably 3-9 months away from being able to see whether the removal of growth targets makes a big difference or not – they have the potential to foreshadow a seismic shift to a more sustainable growth model. I suspect the outcome will be that with the Communist Party Conference done now the impetus will switch to slowing the economy as much as possible, but with any sign of unrest the debt taps will be turned back on. Our expectation is that China is going to continue to “glide” lower to try to normalize the capital expenditure to consumption in-balance that we discussed in our recent webinar. It is our view that the Chinese economy will continue to slow over the coming years – Japanese style lost decades, and low inflation/deflation remain more likely than a dramatic bust, which means a grind lower for commodities and the Australian dollar. The broad sweep of our asset allocation over the last 12 months was to ride the Trump Boom, switch into Europe in March / April as the US became overvalued and then switch back into the US as the Euro rallied and the USD fell. In February the Growth fund increased by 1.3%, the Accumulation by 0.9% and the Income by 0.7%. 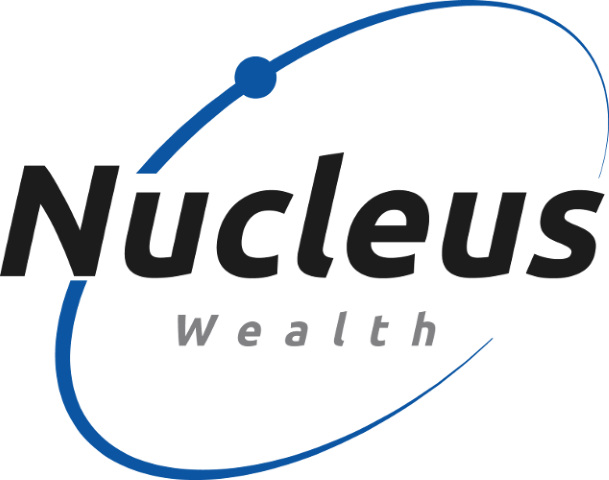 We remain underweight shares in aggregate, overweight international shares and significantly underweight Australian shares. Our tactical foundation portfolio is designed for investors with lower balances, it uses exchange-traded funds for its international exposure rather than direct shares. The reason for this is parcel sizes, you can’t buy half a Google (Alphabet) share directly and so we use exchange-traded funds which buy baskets of stocks instead. The tactical portfolio is a balanced fund, not as aggressive in its holdings as the growth fund nor as conservative as our income fund. In February this fund increased by 0.4%. The fund continues to be underweight Australian stocks. Our international holdings outperformed in February – the MSCI World fell 0.3% (in Australian dollars) while our fund increased by 1.3%. the short term is not positive for the sector with oversupply and OPEC needing to cut production to try to prop up the oil price. Meanwhile, oil stocks are pricing $60-$70 oil prices in perpetuity. The mid-term is going to have to be spectacular to justify current share prices, let alone getting any share price growth. Having said that, it is a big risk to our portfolio being underweight energy. If there are geo-political ructions, particularly in the Middle East, we would probably underperform. October saw the oil price rise once more, largely on the back of hurricane-related supply constraints, but we remain comfortable with our holding and expect much of this to be a short-term issue. Our sole holding in the energy sector, Neste Energy is up around 50% over the past few months, which has shielded up a little from the rising oil price. Neste is a Finnish oil refiner, making a significant investment in green technologies and is well regarded by a number of sustainable rating firms including being in the Global 100 most sustainable companies, the Dow Jones Sustainability index and CDP. 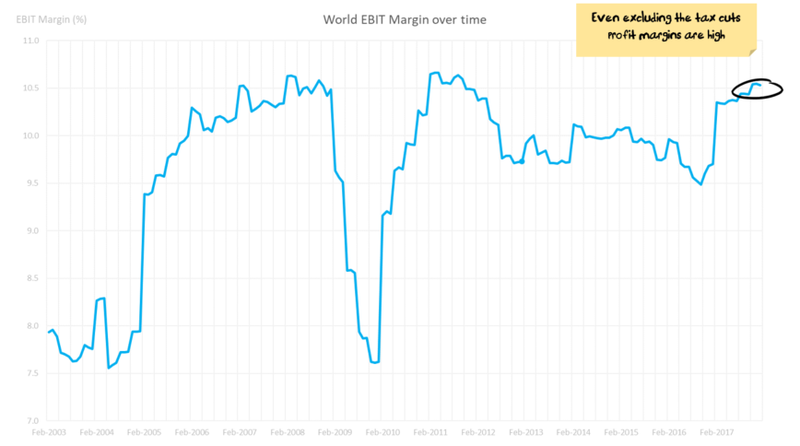 We are underweight financials – mainly as we can’t find US financials that are cheap enough to justify purchasing. We have been trawling the European banks for value. Insurance continues to be a sore spot, there was some bounce back in insurance company share prices in October after a hurricane-affected September, but shareprices have been weak since then. We are looking to continue to build holdings in the sector with the view that after such severe losses in 2017 that insurance premiums will rise significantly. We have a reasonable tech / IT exposure. There are a number of smaller tech stocks that we own, in particular, a range of semiconductor stocks where we like the growth outlook. It is worth noting that part of the reason for Apple increasing the price of its latest phone is an increase in memory and components. This is a positive for semi-conductor stocks more generally, especially if a “feature war” breaks out in the smartphone space. We current hold a range of stocks that should be helped by this trend (Lam, Applied Materials, Skyworks, and to a lesser extent Cisco). Our portfolios to date have been both out-performing benchmarks, and taking less risk. The disclaimer is that they have only been running for seven months, and that is not enough time to make definitive judgements. For the sake of comparability, we have used the Vanguard MSCI World ETF (ASX:VGS) to compare to our international portfolio – VGS is an index fund investing in the same stocks that we do. We retain relatively large cash balances to hedge against volatility and to look for a cheaper entry point. If markets continue to be weak then we will look to buy more equities. We are concerned about the potential for trade wars, which will be a key focus for us over the next few months. We usually find that big picture macro themes take a long time to resolve themselves in financial markets, but when macro theme resolve themselves they do so quickly – usually too quickly to reposition your portfolio if you are not already invested. This entry was posted in Performance and tagged Asset Allocation, performance.